How can Mother Nature possibly compete with cable-TV and X-Box? 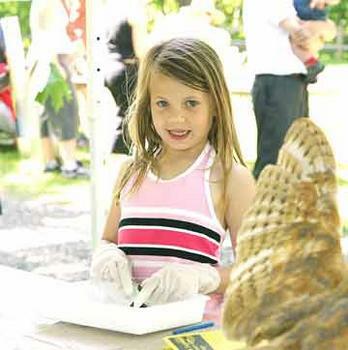 “We doing it by holding an annual Children’s Nature Fair,” said Katie Goodwin, spokesperson for Leach Botanical Garden. 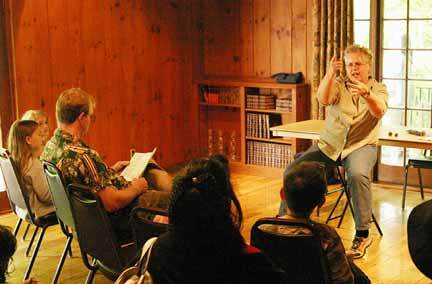 Captivating the kids by spinning a tale about a spider is Ann Found, a professional storyteller, and Leach’s volunteer coordinator. 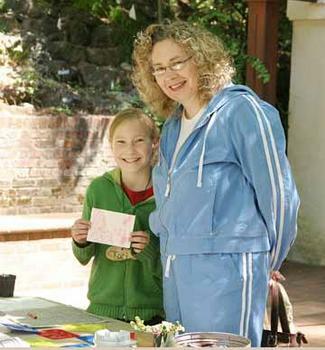 Using the “rubbing” technique to make a greeting card with a dog on it is third-grader Tori Phillips, with a little help from her mom, Vickie. This event has grown over the years, Goodwin remarked. More than 20 volunteers help with the crafts, and take families on tours around the garden property. Her hopes are already being met. While visiting the fair, we talked with parents, who, as children, attended their first Nature Fairs years ago ‚Äì and are now returning to Leach Gardens with their own kids. 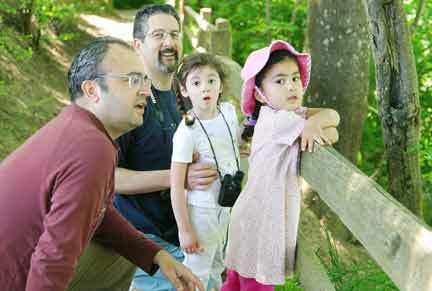 Leach Botanical Garden is located on SE 122nd Avenue just south of Foster Road, and is open most days. Sorry we don’t have a PodCast running here on our website yet, but if we did you could hear the great sounds as they were laid down by the Dennis Mitchell Band, photographed here at the New Copper Penny in Lents a few weeks ago. When he was young, Dennis Mitchell was known has the “little brother” of Mike Mitchell, lead guitar player of The Kingsmen (of Louie, Louie fame). The band also rocked out on May 21 at the Crystal Ballroom as part of a successful benefit for ’60s and ’70s light show guru Gary Ewing. Check ’em out at www.dennismetichellband.com. Portland Police Officer Mike Gallagher pulling in with the Cadet trailer loaded with bike helmets. On the Fun-O-Rama Parade reviewing stand, ready to announce the passing parade, are Bianca Gille, St. Therese; James Luu, Parkrose High School; Michael Taylor, Superintendent, Parkrose School District; Fred Sanchez, GABA and Realty Brokers at 111th Square; Barbara Rommel, Superintendent, David Douglas Schools; Barbara Ho, David Douglas high school. 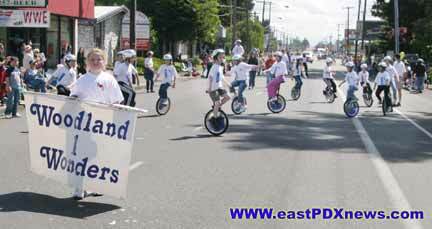 The Woodland Wonders unicyclists always are a hit on the parade route. 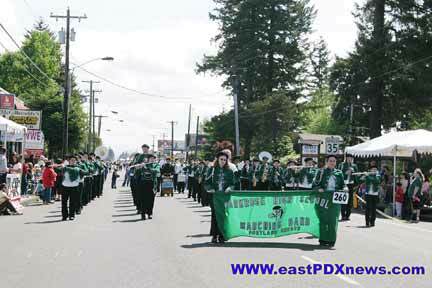 The Parkrose Broncos Marching band gets everyone’s feet tapping. 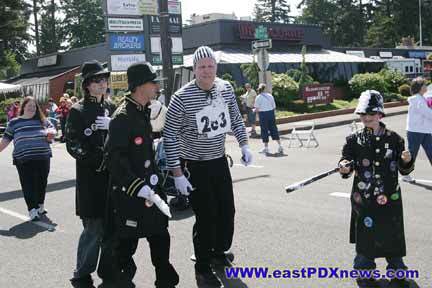 It wouldn’t be a Fun-O-Rama Parade without the antics of the Keystone Cops. 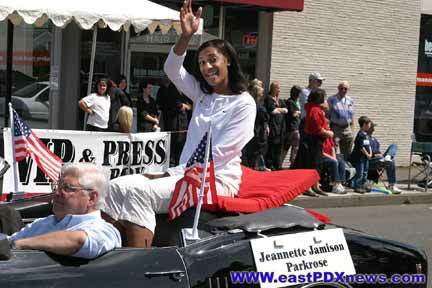 Multnomah County Commissioner Lonnie Roberts rides in the parade. Portland Police Bureau Training Division Officer Garth Edwards, Portland Police Bureau, pipes while the Color Guard raises the flag that signals the start of the Fun-O-Rama Fair at Realty Brokers’ 111th Square. Callie Rousch, LMT, NCTMB gave us a really GREAT chair massage at the Fun-O-Rama Fair! Contact her at (503) 860-4175 for more information. Krysia Woods getting a balloon sculpture made by Steevie Weevie, the Clown Prince of Gateway. “He’s really nice, and funny,” she commented. 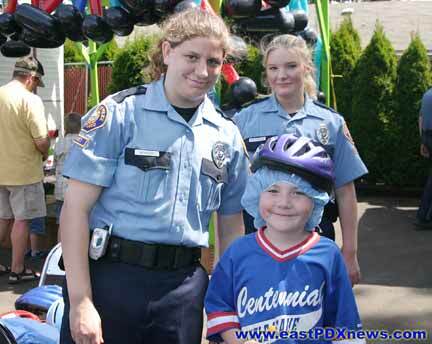 Jeffrey Kamper is getting fitted for a new bike helmet by Portland Police Cadets Leanna Heasley and Keeden Mollenhour. 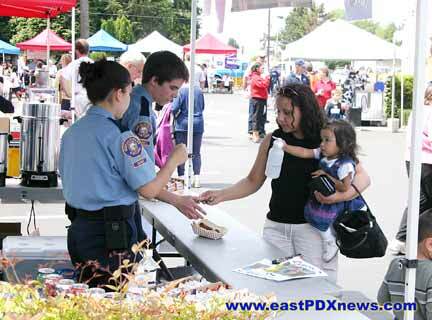 To help support the activities of their program, East Precinct Portland Police Cadets served up hot dog lunches at the Fun-O-Rama Fair. 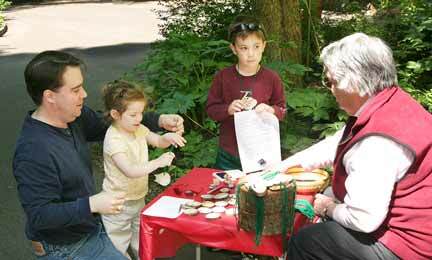 Making crafts are Traci and Nicholas Shaffer, at the Portland Parks and Recreation booth. 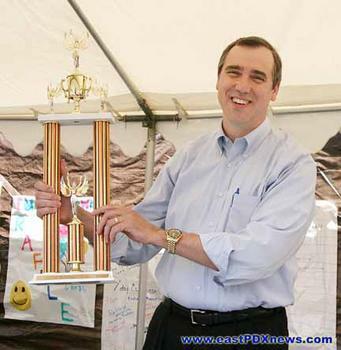 Oregon State Representative Jeff Merkley presents awards to for entries into the Fun-O-Rama parade. As part of the entertainment, Bianca Gille, student body president of St. Therese, beautifully sang a couple of songs. 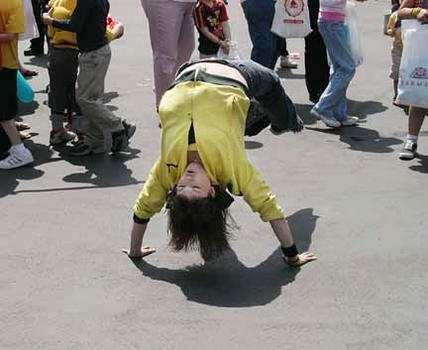 Demonstrating the lively art of street break dancing is Melissa Spivally. Both businesses and community groups exhibited at the Fair. 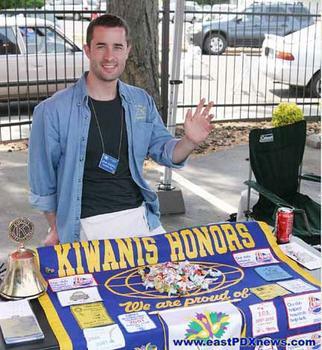 Here’s Jason Goodwill, telling people about his Kiwanis group. 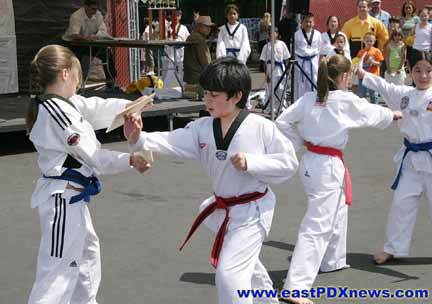 Lexie and JJ, of Choi’s Martial Arts Academy, demonstrate how to break a solid board with just your hand. 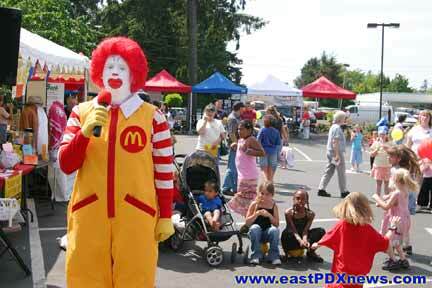 Ronald McDonald shows up for some silly fun. Perhaps we’ll see you at the 2007 Gateway Fun-O-Rama Parade and Fair next May! Helping with the planting project are Mike Schmidt, Stanley Tools; Dave Winterling, Stanley Tools; Kris Cowan, Joe Kelley, volunteer on the site; and Todd Cleek, volunteer and member of the board of directors of the Kivel & Howard Law Firm. East on SE Stark, near the Gresham city border, another Habitat for Humanity development is about ready for happy families who got the opportunity to buy new, reduced-priced housing in outer East Portland. Cowan explained that families work on their own development, and that of others, as a way of earning “sweat equity” in their new homes. 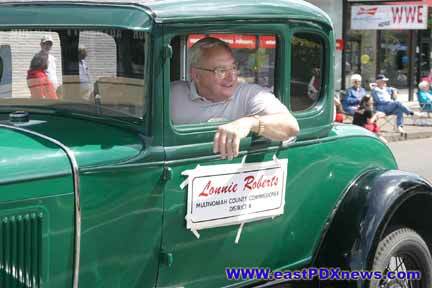 Hundreds of all kinds of specialty vehicles are on display at the Parkrose Rose Festival Cruise-in on June 24. 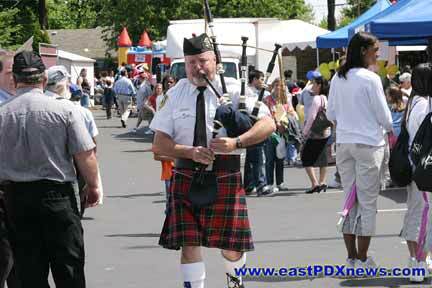 What’s the ONLY officially-sanctioned Portland Rose Festival event located east of the 82nd Avenue of Roses? 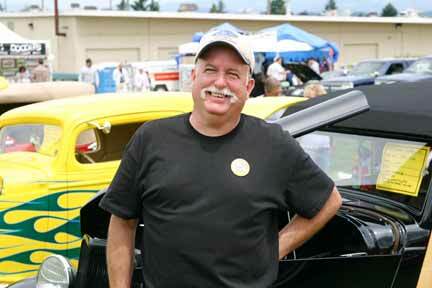 It’s the 5th Annual Rose Festival Cruise-in, on June 24. It runs from 10 a.m. to 3 p.m. on the grounds of Parkrose High School Community Center, 12003 NE Shaver, just west of NE 122nd Avenue. 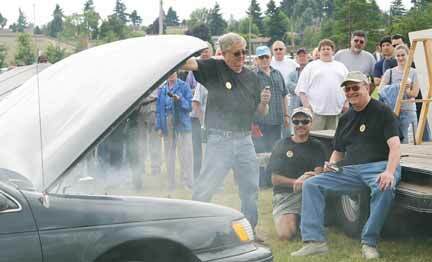 Gail Bash’s “Blow Up” car competition is always a gas! They run ’em without coolant until they ‚Ä¶ blow up! In addition to the hundreds of cars on display, vying for trophies in over fifty categories, you’ll find food booths (including wonderful offerings from Chef Edgar of Steamers Restaurant), booths showcasing community services and PBA members’ wares and services. You’ll find great food, like dishes served up by Chef Edgar of Steamers Restaurant. 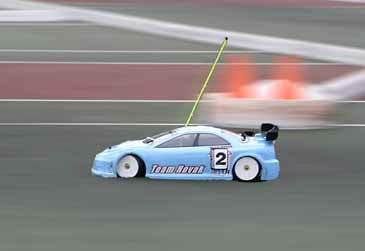 Remote Control cars race at speeds of up to 100 mph throughout the day. And, you don’t need a Pit Pass to talk with the drivers and see their cars! Back again this year is the high performance Remote Car Races. You’ll be amazed to see these cars tear around the track at actual speeds of over 100 mph. 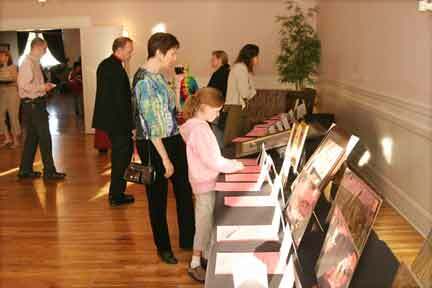 Also, there’s an area especially for kids, making this a great family event. Each year, the Parkrose Business Association (PBA) uses the Rose Festival Cruise-in to help fund scholarships given by the Parkrose Business Foundation to help area students continue their education after high school. The foundation grants several $1,000 scholarships each year to deserving Parkrose Area High School students, to help further their college education. Rex Hollingsworth, Rex Heating and Air Conditioning, is the Event Sponsor. Beyond his financial assistance, he and his team help set up the Cruise-in, run it, and have given the association a trailer to store the event’s supplies! The Cruise-in receives major financial and logistical support from many PBA members, including the Official Event Sponsor, Rex Heating and Air Conditioning, and major sponsors Bank of America, Parkrose True-Value Hardware, and West Coast Bank. And, Craig Mendenhall of American Sani-Can makes sure there are plenty of their spotless special blue booths, when duty calls. 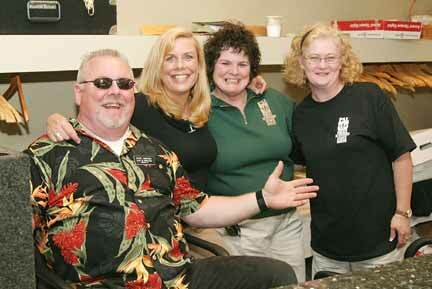 For more information about the Rose Festival Cruise-in, contact Marsha Lee at (503) 257-3229. “After Hours” allow members and guests to gather, network and learn at an evening event once every quarter, in addition to the groups weekly Wednesday morning meetings. 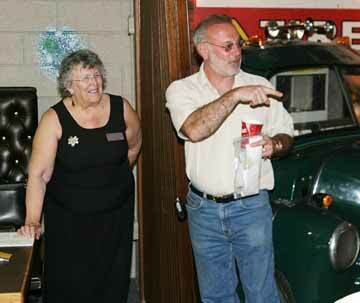 Everyone who came to the East Portland Chamber’s “Chamber After Hours” event at Bill Dayton’s (on the right) Pizza Baron was greeted by the savory smell of pizza, served by event sponsor (left) Nancy Chapin, The Support Group on May 18. 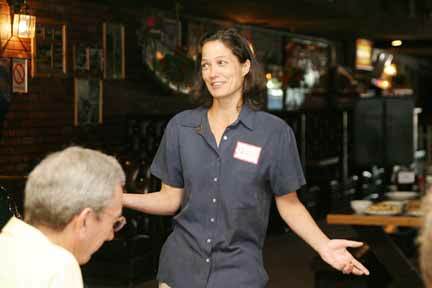 Bridget Bayer, guest speaker at “Chamber After Hours”, explains why and how a professional mediator can help them save big bucks on lawyer and court fees. Bayer said mediators are impartial, have no authority to make decisions, don’t give legal advice and guide a discussion maintaining a safe, open environment ‚Äì while being optimistic that the process brings progress. After hearing how mediation works, those gathered broke into small groups and used role-playing and practiced using some of the concepts they’d learned. To learn more about mediation, contact Bayer at (503) 752-8517. While most of our East Portland Chamber of Commerce members were hidden behind dignitaries, EPCC supplied ceremonial ribbon and giant scissors as they do for grand openings across East Portland. Hard to believe it was 30 years ago when this, the first “airport hotel” in Portland, opened its doors in 1974. The owners completely remodeled the hotel over the last year. The gala event on May 23 was attended by Chamber president Greg Zuffera, and Ambassadors JoLynn Walker, Lisa Upshaw and (holding camera) David F. Ashton. 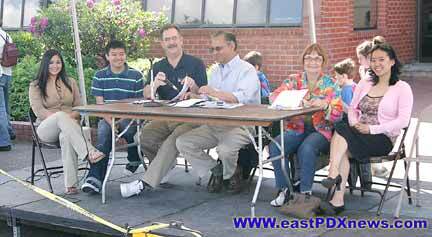 The East Portland Chamber of Commerce Ambassadors provided the ribbon and ceremonial scissors. 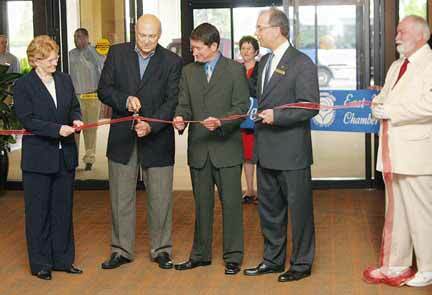 With a snip, the hotel was officially reopened. 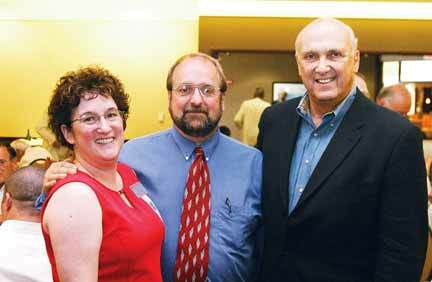 Celebrating the “grand re-opening” of the Sheraton Portland Airport Hotel are Greg Zuffera, BC Graphics; hotel owner, Harold Pollin, Lisa Upshaw, Bay Bank. After brief remarks, about 100 dignitaries were led into Mt. Adams banquet hall for a lunch of Endive and field greens, wild salmon served over a crisp potato cake, tomato caper vinaigrette and asparagus bundle. 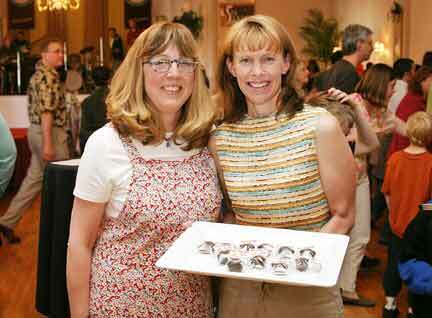 To top off a delicious meal, the guests were served a decadent ganache cake with cr?®me anglaise. No wonder this hotel caters many East Portland banquets and events. After lunch, we reminisced with Pollin, with the owner, about their first advertising campaigns. Your author took the photos used in their first advertisements some 30 years ago! 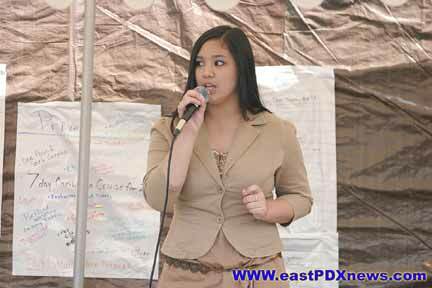 For more information about the East Portland Chamber of Commerce, check their web site at www.eastportlandchamber.com. DJ Steve Andersen spun tunes while Patricia Peneyck, Debra Monk Terri Baker checked folks in to the “Blast from the Past” auction for PAL on May 13. We expect cops to bust the crooks, and hold criminals at bay. It’s their job. 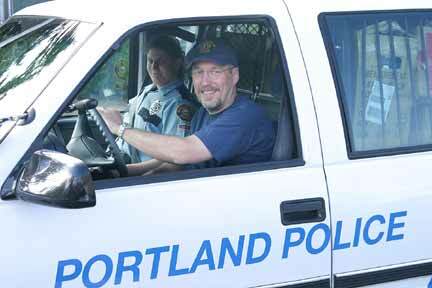 But do you know that Portland Police Bureau officers volunteer their time, working with more than 3,500 youth each year, to help them stay on the straight-and-narrow? While none of the cops get paid for this, it does cost money to house the program, provide transportation to and from events, and buy supplies for the PAL programs. 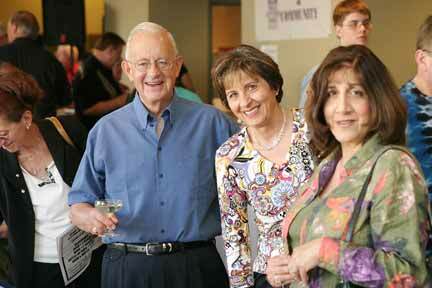 Bill Bitar, Frank Bitar & Associates, with wife and friends, checking to see how much his bids were raised. More than 285 people came to the Sheraton Airport to bid on a silent and live auction, enjoy a dinner ‚Äì and, in the process, raise $125,000 for PAL. “It is a great outreach for us,” Jolly said, asking that we mention that Safeway was a major sponsor this year. OK, we did! Want to help? 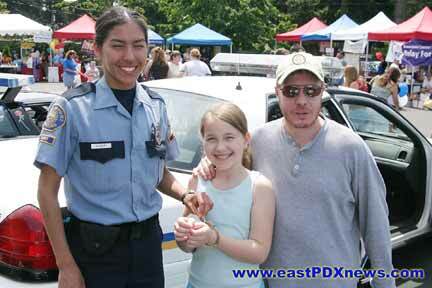 Contact www.palkids.org, or (503) 823-0250. 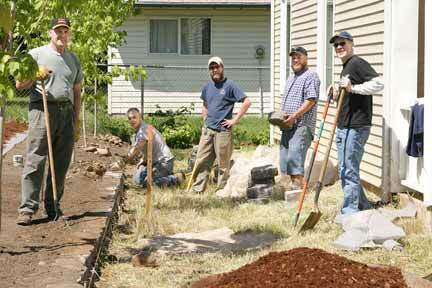 “We’re always looking for good volunteers,” Jolly added. Nancy Chapin checks in some of the 150 party goers to “Hawthorne: Party On” at Chelsea Ballroom. 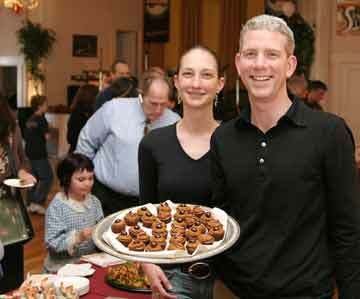 There was no shortage of great food at the Hawthorne Business Association’s May 12 event. The second-story Chelsea Ballroom started filling up promptly as the doors opened for the first-ever at “Hawthorne: Party On” event on May 12. “We love our neighborhood and wanted to say ‘thank you’ to them,” is how organizer Reese Prouty, chair of the Hawthorne Boulevard Business Association explained it to us. “This is about thanking our neighbors, and at the same time, helps business owners get to know more people in the boulevard. Greeting neighbors at “Hawthorne: Party On” are organizer Reese Prouty and Michele’s Chirgwin of Michelle’s Chocolate Truffles on SE Hawthorne at 22nd Ave. 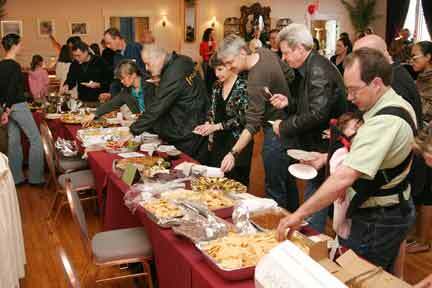 Lining the walls of the ballroom were all kinds of food, prepared and presented by 35 restaurants along the boulevard. 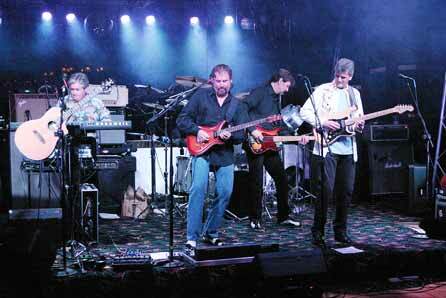 The Blueprints lay down some great blues music tunes early in the evening. They made way later in the evening for headliner Robbie Laws, who established a studio on Hawthorne and teaches guitar lessons. 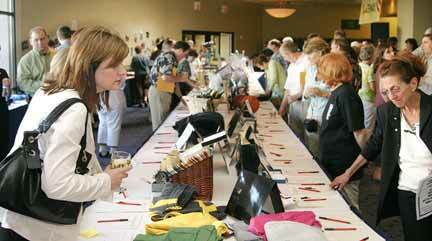 To raise additional funds for their organization, the group conducted a silent auction, featuring donated services and merchandise. Nearly 100 items were up for bid. There was a lot of action on two Oregon coast vacation home rentals. 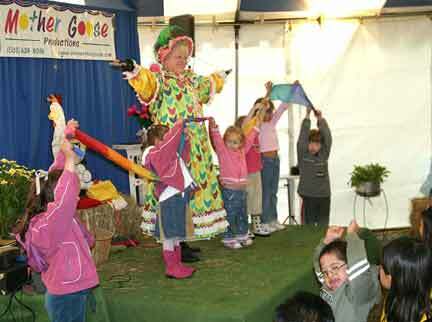 With the help of children from her audience, Mother Goose brings barnyard magic to the Multnomah County Fair. Locating Multnomah County Fair at Portland Meadows for the past two years allowed organizers to hold the event in late summer. But, somehow, it never had the “fair-like” atmosphere of its longtime location, the Expo Center–or of its immediately previous home, Oaks Amusement Park. 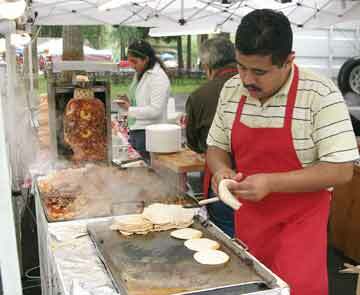 Cooking up big, flavorful burritos is Martin Ochoa. This year’s edition celebrates the county fair’s 100-year history. But if it weren’t for the volunteers who make up Friends of Multnomah County Fair, it would have blinked out of existence years ago. 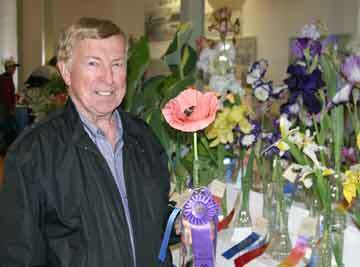 Although the fair’s return to Oaks Park wasn’t well promoted, other than in a front-page story on East PDX News and in The BEE, the exhibit hall was filled with quality entries, ranging from baking to sewing arts, photography ‚Äì and yes, even garden entries. Kids, whose families who braved the weather in the first two days of the three-day fair, enjoyed Humphrey’s Barnyard Frolics–featuring the magic of Mother Goose, hands-on action exhibits like cow milking, and making “Mud Baby” crafts. 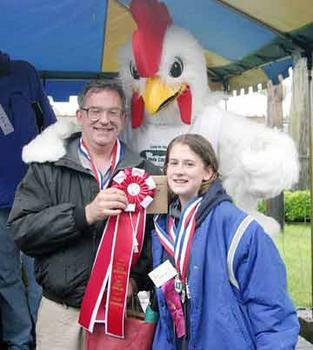 Grand Sweepstakes winner in the First Annual Oregon Fryer Commission’s “Big Cluck Cook-off” were Tim and Rosie Wallace. 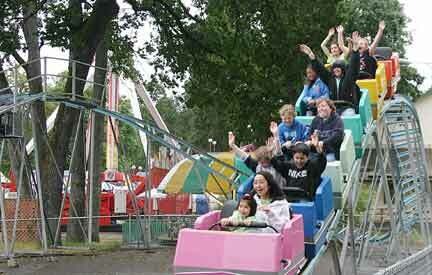 A few raindrops didn’t keep families from enjoying the rides at Oaks Park. On Saturday, May 27th, the opening day of the three-day fair, a stormy sky delivered moisture–ranging from a gentle mist to wind-blown pelting rain throughout the fair’s first afternoon. But, Oregonians dressed weather-appropriately, and got their thrills on many of the amusement rides at the park anyway. The event faired better on Sunday with cool weather under heavily overcast skies. By Memorial Day, the sun came out ‚Äì and so did families. 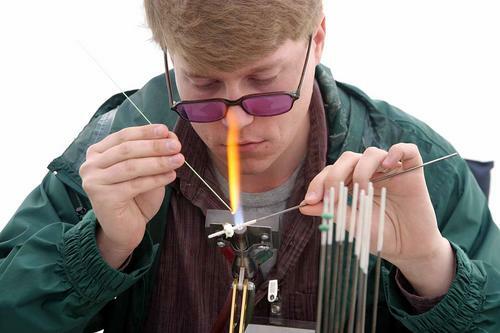 SE Portland glass artist Scott Hogan, with Jess Hogan Designs, demonstrates creating a bead made used in jewelry making for people at the fair. 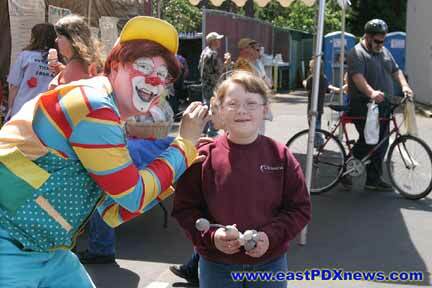 Will there be a Multnomah County Fair next year? At the Sellwood Park Bird Festival, we met Bob Sallinger, holding a swallow plaque painted by his son, Peter. Under the sunny sky, in warm, spring weather, May 13th supplied a perfect setting for the “International Migratory Bird Day” at Oaks Bottom. Asked how the event might accomplish this goal, Sallinger told us, “When we get people to take a walk with us, and they see what’s going on, it helps them understand our mission. There is no better way than to have people simply look up! I’ve worked for Audubon for 14 years, and I’ve heard so many people tell me they never really look. 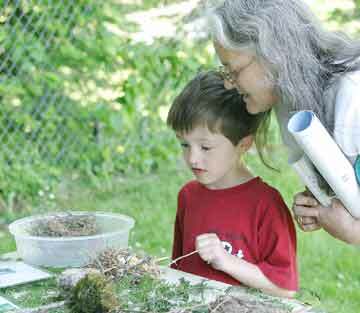 Elizabeth Kramer, Audubon Society educator, spent the day checking in people for the bird walks. She talks with Carole Harmon. 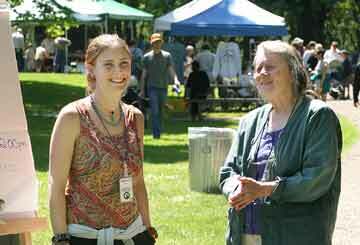 In addition to the Audubon Society hosted guided tours of Oaks Bottom, the event in Sellwood Park featured a half-dozen craft, activity, and informational booths for adults and kids to enjoy. Mr. Sagar, Steve Feiner and daughter Rachel, Malina Sagar, and their families say they came to the Bird Festival to see birds, and take the kids for a beautiful walk. At the US Fish and Wildlife “Conserving Nature” exhibit, Maxwell Schmidt is working on a craft project with the help of his grandmother Kevin Wright. Emma Rose McMillan has gloves on, protecting her hands as she works at another booth creating crafts. 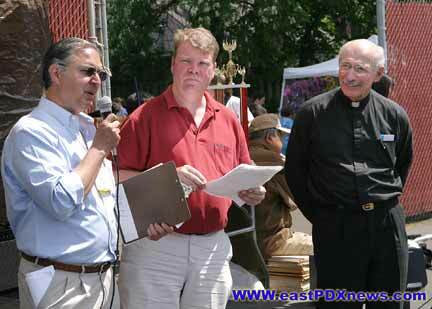 In mid-afternoon, Mayor Tom Potter came by to be part of the celebration. 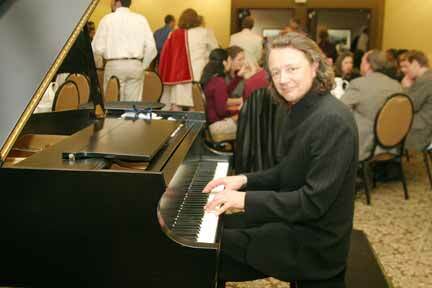 In an exclusive interview, he told us, “Portland is known for its livability. I believe that birds are an important part of it for all of us. 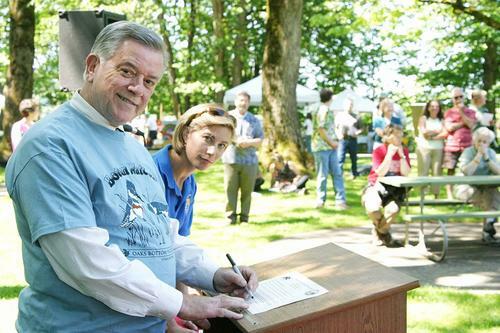 At the official ceremony, Portland Mayor Tom Potter signs a “Bird Treaty” certificate, as Miel Corbette, Fish & Wildlife Service, looks on. 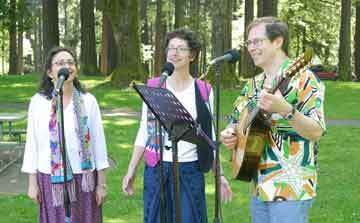 Robera Jortner, Anne Rutherford, and Jan DeWeese make up The Tanagers, performing their song “The Great Pacific Flyway” as part of the official Bird Festival ceremony. The Taylor Electric fire was so intense; embers flew up stories high into the air. 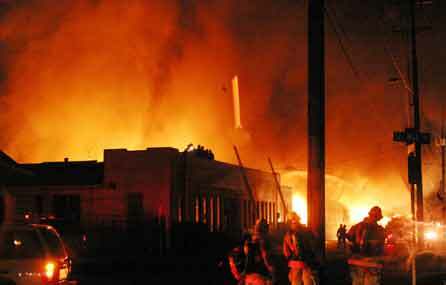 In fact, a pallet rack shelf was projected high into the night sky by an explosion of burning material, carried up on convection current. 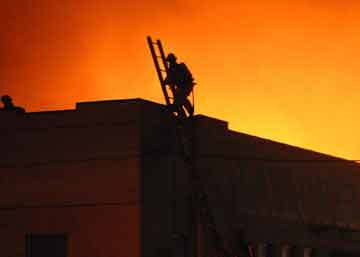 A firefighter climbs atop an adjoining building to make sure embers didn’t set it ablaze. It was a typical, busy day for the firefighters at Westmoreland’s Station 20 on May 17. But their shift eventually included fighting one of the largest fires in recent history. Station 20, located on S.E. Bybee Boulevard, just west of the Bybee Bridge, is a four-person station house. 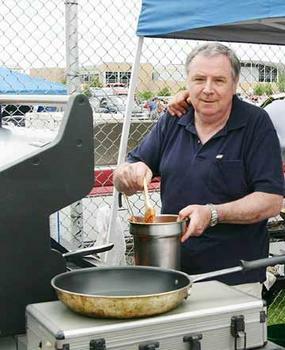 By early evening, Gallucci and Jeff Von Allmen had set about making dinner for the crew. “We all ate, and the day started to slow down,” Von Allmen said. They could see a train was blocking the Milwaukie Avenue crossing north of Powell, so they cut over to McLoughlin Boulevard, north on S.E. Grand, then to Clay Street. “The fire was really ripping,” Gallucci continued. 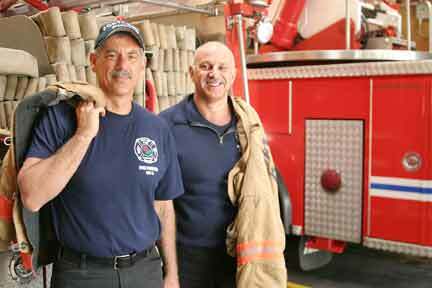 “I was the driver for the shift, so I started up the pump as the other crew members hooked up hoses at S.E. Second and Madison.” The blaze was just west of MLK Boulevard, just north of the Hawthorne Bridge, and only a couple of blocks east of the Oregon Museum of Science and Industry, and a branch campus of Portland Community College. Because a high ladder truck carries no water, and doesn’t have its own pumps, it’s fire engines like Engine 20, that boosts the hydrant water pressure enough send it up the hose to the top of the five-story-high ladder, so it can be sprayed down on the fire. About an hour after the fire was discovered, the roof on the city-block-sized building collapsed, spewing a shower of sparks and cinders, and blowing large boards high into the night sky. 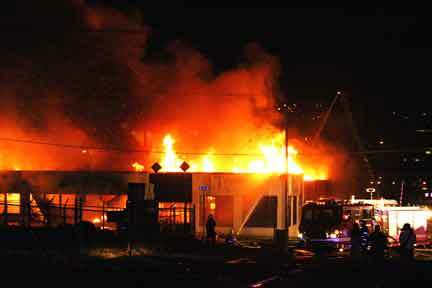 Firefighters were dispatched to the roofs of nearby buildings to make sure they didn’t catch fire. Through the wee hours of May 18th, the Sellwood-Moreland firefighters stayed at their post, supplying 1,500 gallons of water per minute, for four hours ‚Äì pushing 360,000 gallons of water, from their rig alone, to douse the conflagration. “The fire burned so hot,” Von Allmen added, “it burned out pretty quickly. Sometimes a large fire like this can burn for days.” Working together, a total of 125 Portland Fire & Rescue crewmembers managed to protect all of the surrounding buildings. To prevent electrocution, Portland General Electric crews disconnected power from the industrial area’s grid shortly after the fire broke out. Good thing; at least three power transformers exploded in the fire’s intense heat, releasing their cooling oil. Millions of gallons of water running off from the firefighting carried it into Willamette River. 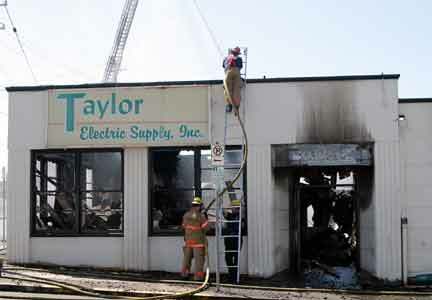 According to Taylor Electric’s operations manager, the burnt building was filled with about $4 million worth of inventory, including wire, circuit breakers, transformers, and other equipment. 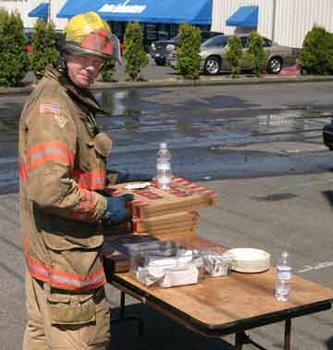 Eating pizza provided by a nearby business owner is firefighter John Robinson with Station 4. As firefighters continued to douse the smoldering rubble the following morning, a table laden with pizzas appeared outside Rose’s Restaurant Equipment, directly across the street from the burned out building. 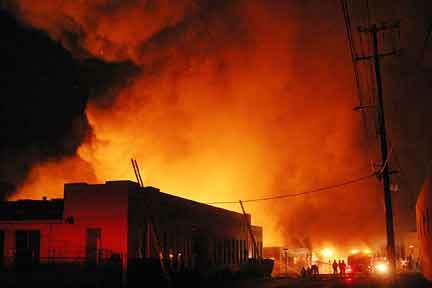 The pallet fire burned so intensely, Oswalt explained, that it broke the building’s exterior windows nearby. 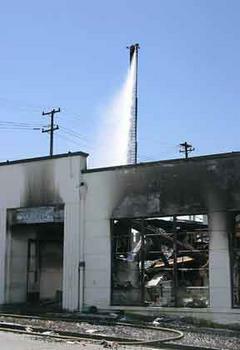 The fire then jumped inside the building. He confirmed that the company’s last employee had left the building some four hours before the start of the fire, and that nobody was in the building when it burned. The fire investigation is continuing.